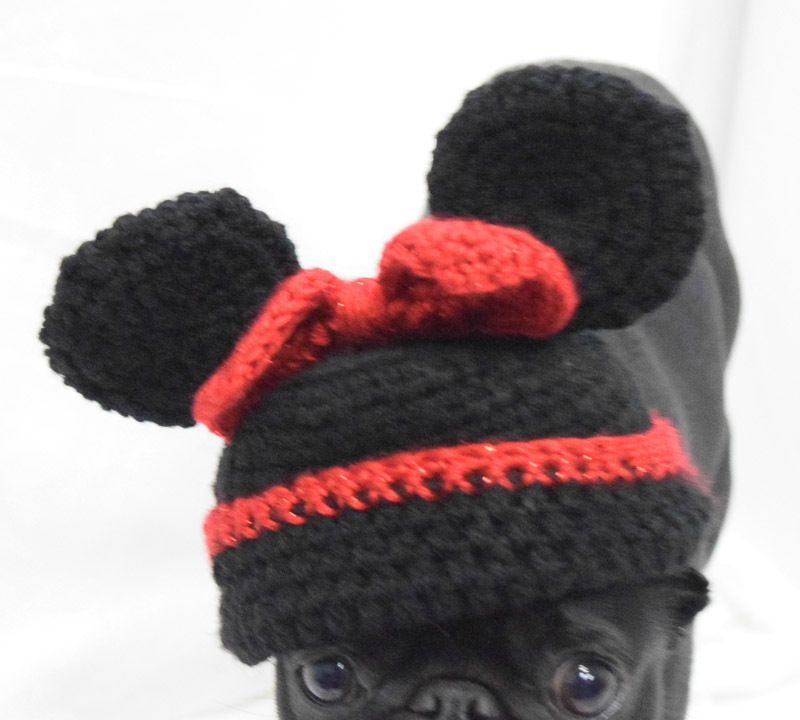 Today I bring you the latest pug in our Social Pug Profile series and this time I have the gorgeous black pug, Gwen, all the way from North Carolina, USA. Gwen has taken the time to sit down and answer the tough questions so you can all get to know her a bit better. Gwen has a pretty awesome life living with her parents and having a pretty good social life, not to mention a great sense of fashion. If you don’t already know and love Gwen, this interview will be sure to make you fall in love with her. What is your favourite time of the day? My favourite time of day is anytime I get to eat! But my second favourite time of day is when I get to work with Mum, she has a tradition that right when we get to the office in the afternoon I get a bone. So first thing I do is run into her office and stand next to my desk drawer and wait. Usually Mum thinks this is funny and she makes me go say hello to all my coworkers first, so I run around like crazy trying to find them all so I can get my bone. What is your favourite food? Anything edible! I love fruits and veggies, my favorites are bananas and apples. I can smell a banana from a few rooms away! I also really really love salmon skin and if I smell salmon I bark my head off. Same with bacon! Love bacon! Oh and then there is peanut butter, that stuff is amazing! I love food. Do you have a toy that you can’t live without? Yes, at home I have Tito, he is my bear an he is probably the same size as me. I love him so much. Sometimes I try to kill him but mostly I cuddle him. Mum can ask me to go get Tito and I can find him in any room of the house. Sometimes I have trouble jumping onto the big bed with Tito in my mouth because he gets in the way, but I won’t leave him by himself so I try 10 times to get on the bed until I finally make it up there. At the office my favorite toy is Mr Bear, he is as long as I am but I love him too! When Mum is in a meeting I will scratch at the door and when she opens it I have brought Mr Bear to play. I also show him off to new clients that I want to play with me. What do you hate the most? I hate loud noises and cardboard boxes! When the FedEx or UPS people deliver at the office I go crazy barking at them because they always bring big boxes. One day I scared a big man delivery a box and he ran out of office so fast. 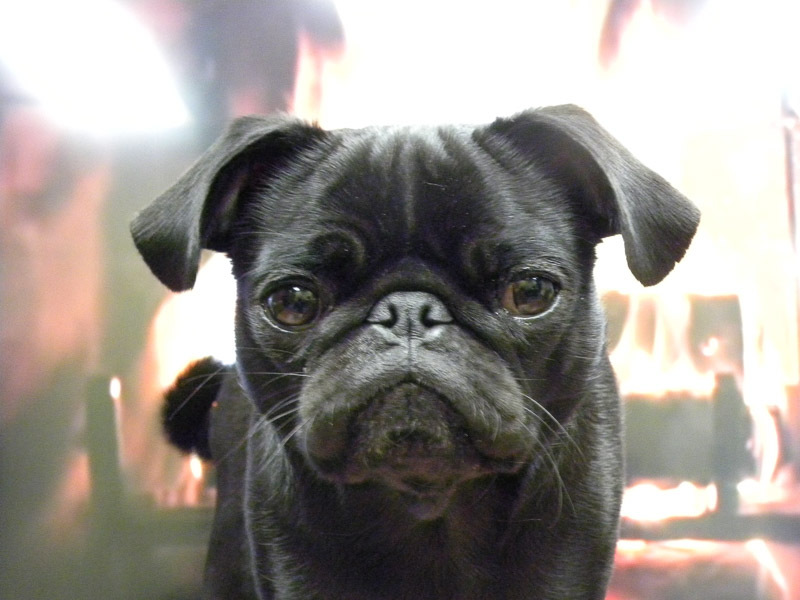 Mum and the Big Boss laughed, but I am a tough pug. What do you love the most? My humans. I want to go everywhere with them always and sometimes I get sad when I have to stay home, although I mostly sleep at home, but still I want to always be with them. Always. Do you have any bad habits? I am a perfect pug lady! Just kidding! I am learning to sleep in my little bed at night but I still really want to be in the big bed with mum and dad so sometimes I get up in the middle of the night and cry next to the bed. So I am learning to be okay sleeping in my little bed next to the big bed. It’s a work in progress. What do you think is your best quality? My sassy attitude! I think it gives me character. What does a typical day look like for you? I wake up at 630am and go out to potty then I have breakfast and a bone. Then I go back to sleep until around 12pm when Mum comes home for lunch. Then I get to go play in the backyard and then go to work with Mum. We stay there til dinner time, then we go home and I eat and go for a walk and play with Dad a little until bed time. 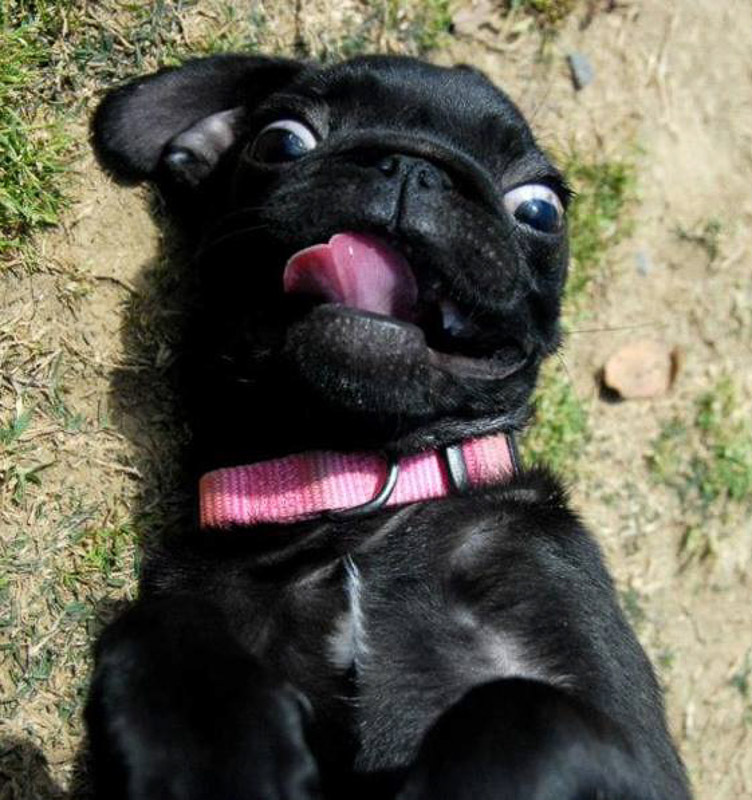 You are a very fit looking pug… What is your secret to maintaining such a good figure? Aww thank you! I am still pretty active, I like to play a lot, and I also go to the dog park on the weekends or have @OzzyPuggy over to play which takes a lot of energy. Mum also likes to walk me at night to get some of my energy out! You have pretty cool style… Is there someone who inspires your fashion choices or are you a trendsetter? Thank you! I try to be a trendsetter with my bows and fashion choices, and I am usually cold so I don’t mind clothes being on me. Mum takes advantage of that! 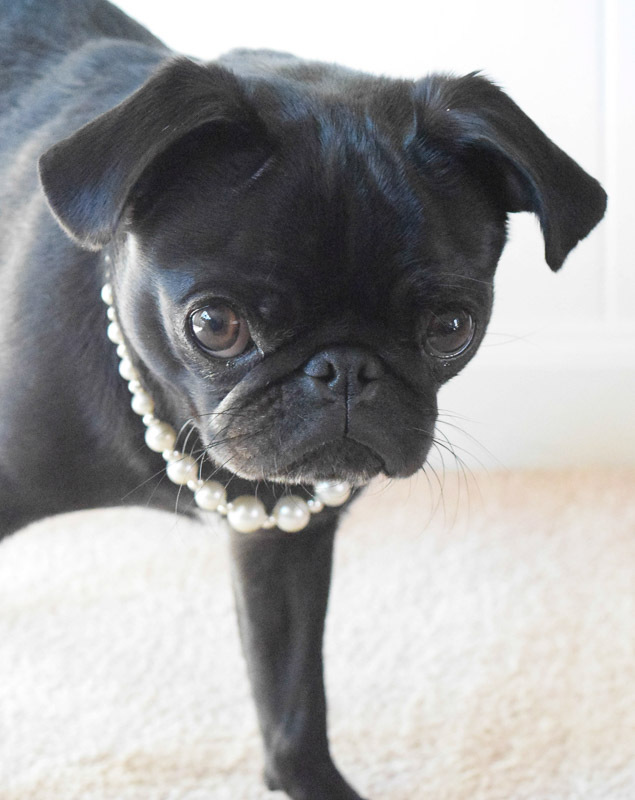 I would say I am really inspired by @thestylishbisou she has so many girlie outfits! Do you have any tips for pugs starting their own Instagram account? Be true to yourself, don’t try to do what every other pug is doing. If you make silly faces then post those silly pictures. I don’t always show myself looking cute, I am not afraid to show the outtakes and I think that makes people laugh! I just want to make one person smile everyday. Gwen is one of my IG girlfriends! What a delightful interview! She is very special. Thanks Pug Diary for asking such great questions! Thank you Kate! Gwen is just too adorable and I’m so happy to share her with everyone. 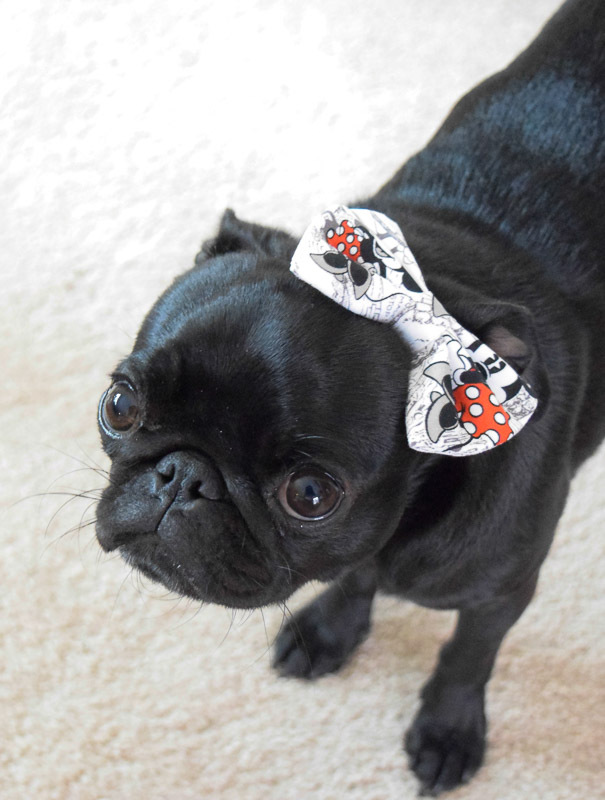 Gwen is such a beautiful, stylish girl pug. I’m one of her many IG fans. This article is delightful. Thanks for stopping by and reading about Gwen. She really is a wonderful pug. I love the duck outfit too. Gwen is totally adorable. Thanks for stopping by Swah! We love Gwen we follow her life on IG, she has attitude and she’s funny too. We’re new to Instagram we’ve only been on for about 4 months. Gwen is certainly a great pug. We love following her on IG too. Enjoy the IG experience. It is addictive though. And thanks for stopping by Karen. Tofu and I follow Gwen on Instagram. She is such a cool chick! Love this interview! Thanks for stopping by Ellie & Tofu. I loved sharing Gwen on here. She is a very cool pugette.